I was first introduced to Forty Creek when I was at the liquor store looking for a half decent rye and was short on cash. I absolutely refused to buy Canadian Club, so that didn’t leave too much else in my price range: besides Forty Creek. Upon tasting it I was impressed with it’s balance and flavour density. For a cheap rye, it packed a tasty punch. Thus began my enjoyable quest of sampling all that Forty Creek distillery had to offer. While all their whiskeys are quite good, none impressed me as much as their Copper Pot Reserve. One of the things I love about Canadian and rye whiskeys is their simplicity. Generally speaking, relative to a good single malt scotch, your average rye has a much less complex flavour profile. This isn’t necessarily a bad thing; often, it’s great just to kick back with a warm glass of rye and not think about it too much. 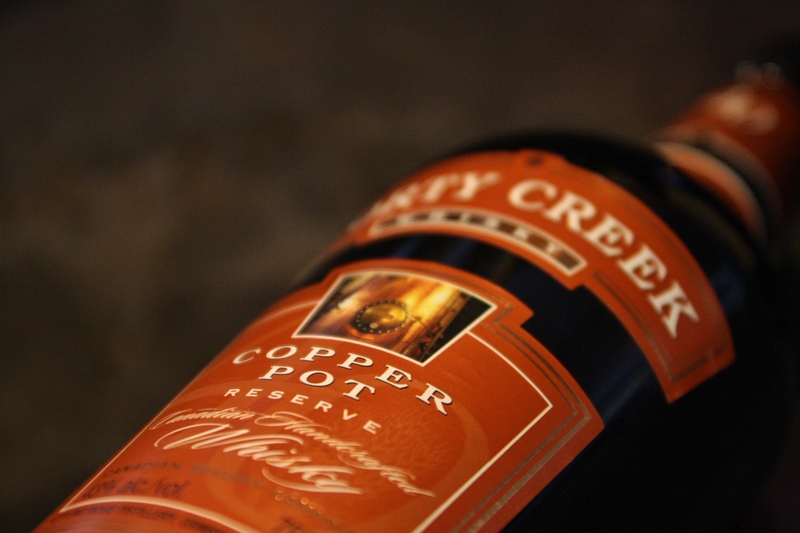 Forty Creek Copper Pot Reserve, on the other hand, is most certainly a whiskey you’ll be challenged to think about. So what makes it different from your conventional rye? Well, Copper Pot is made with rye, barley and corn, and each grain is distilled separately in copper pots before it is aged in oak. According Forty Creek’s website, this extra aging “Amps up” the flavour (whatever that means). Regardless of buzzwords, the smaller batches inherent with the copper pot distilling and the extra aging serve to concentrate the flavours in this whiskey as well as provide it with a slightly higher alcohol content. Just by observing it in the glass informs you this isn’t your run-of-the-mill corn whiskey masquerading as a rye, possessing all the personality of a comatose librarian in monastery (here’s looking at you, Canadian Club). It’s a deep, ochre (dare I say, copper?) colour, looking more like a cognac than a rye. At 43% alcohol, the fumes are quite potent, but steeped with hints of fresh-ground coffee, chocolate and even citrus. The taste is even better. Flavours of mocha, toffee, a wallop of orange and a dash of coriander envelop your palate in a way that may confuse you as to what alcohol you’re drinking. Rest assured, it is in fact a Canadian Rye. While the taste might be good, the price is even better. At $28, it costs only $2 more than your base-model Forty Creek, and less than $3 more than a flavourless alternative (ok, last jab at CC). That means you don’t have to break the bank to savour a damn fine whiskey. If you’re bored with your average fair, and not attempting to punish your bank account, you can hardly do better than Copper Pot Reserve. This Canadian whiskey definitely deserves to be sipped slow. Interested in knowing more about the various kinds of whiskeys? Check out my post What’s a Whiskey? to learn the difference between rye, bourbon, Scotch and more!